Local business owner, Billie Lopez, displaying her latest design at her workshop in San Marcos, Texas on Oct. 1. From freshly baked Brazilian desserts to handcrafted jewelry, Market Days has it all. The first Market Days of the fall semester took place Sept. 25 on The Quad. Many students stopped and shopped at a variety of local businesses on campus. Karrington Ortiz, business junior, said she enjoyed seeing a diverse range of businesses during Market Days. “They had (a business) for natural hair, and I’m natural so that was something that caught my attention,” Ortiz said. Ortiz said another business that grabbed her eye was Billie Lorraine Jewelry. It featured handmade jewelry by business owner Billie Lopez. Lopez first began designing jewelry in 2004 after she decided to leave her job and pursue her career as an entrepreneur. Lopez said she had an interest in fashion from a young age. Growing up, she was influenced by southern, vintage style. She said she considers her pieces to be simple and modern yet elegant and statement worthy. Lopez said she is a proud Texas State alumna. In fact, she is the only licensed jeweler in San Marcos that has the right to sell necklaces with the Texas State Bobcat logo. Lopez is a frequent participator in Market Days. She said she enjoys meeting new students and is often inspired by them. All of Lopez’s designs are handmade in her workshop located in The Square. Lopez said as her brand expands, she wants to continue to design her own components of jewelry. Lopez said her biggest inspiration when it comes to designing is being true to herself and thinking about her own personal style. Son of a Sailor, another local business, was featured at Market Days. Son of a Sailor started seven years ago out of the home of Jessica and William Knopp. Son of a Sailor started off as a small brand but over time, the Knopp’s began selling products from other brands that complemented their simplistic style. Two years ago, the Knopp’s moved to San Marcos. William Knopp, Texas State alumnus, said he knew San Marcos was the perfect place to expand Son of a Sailor. As Son of a Sailor continued to grow as a brand, the Knopp’s realized they needed a larger space for production. In April 2018, the Son of a Sailor San Marcos location opened its doors at 241 N LBJ Dr.
As a relatively new company in the San Marcos area, Son of a Sailor decided to participate in the first Market Days of the semester. Son of a Sailor is the authentic result of the combination of William Knopp’s expertise in design and Jessica Knopp’s entrepreneurial spirit. “When we met our creative energies combined and (Son of a Sailor) became this natural sort of path for us,” Jessica Knopp said. A variety of Son of a Sailor products are handmade. Much of the inspiration in their products comes from patterns and geometric shapes. Market Days has become an event many local businesses look forward to. Once a month for one day only, Market Days will take place on The Quad. 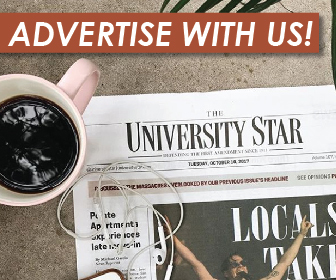 Participating in Market Days allows local businesses to get their brand and products out to Texas State University students, staff and faculty. Local business owner, Jessica Knopp at her store, Son of a Sailor, in San Marcos, Texas on Oct. 2. Handcrafted jewelry and candles on display at the Son of a Sailor store in San Marcos, Texas on Oct. 2. The latest designs on display at the Billie Lorraine Jewelry workshop in San Marcos, Texas on Oct. 1.